The process of solar panels can be perceived quite confusing. We’ve explained how PV panels really work, and how they can benefit your business. A Solar PV system works by collecting the light rays from the sun, this is done by a number of Solar panels (an array), which is normally mounted on the roof. Each solar panel is made up of photovoltaic (PV) cells, wired together in the panel. These cells are made up of layers of silicon and look a bit like blue or black tiles, held together in a neat waterproof, clear-topped panel. When daylight hits the cells it creates electricity, the brighter the sunlight, the more electricity is produced. The direct-current (DC) electricity produced in the panels then flows into an inverter, which converts DC into alternating current (AC) electricity for you to use in your building, any excess is safely distributed back into the grid. You will benefit from the feed-in tariff on all the power your system can generate. Solar panels do still work well in cloudy weather which is great for UK residents. If you have a solar PV system installed at your property, it will automatically feed the power you’ve generated to your lights, sockets and appliances, so a lot of the power you use during the day will be free, potentially all of it! When you are using more power than the panels produce some power will be drawn from the grid. Once installed, you won’t notice any disruption or change – just smaller bills. To make the most of all that free electricity, it’s best to use appliances like dishwashers and washing machines during the day. The system can’t store electricity, so if you produce more than you use during the day, any excess will be fed into the national grid for others to use. Many appliances have delay start functions, which can be utilised, for when you are not at home. Not only will it help you save on energy bills and protect you against rising fuel prices, it will also generate a tax-free income through the government’s feed-in tariff payments and these payments are guaranteed to rise in line with inflation for the next 20 years. 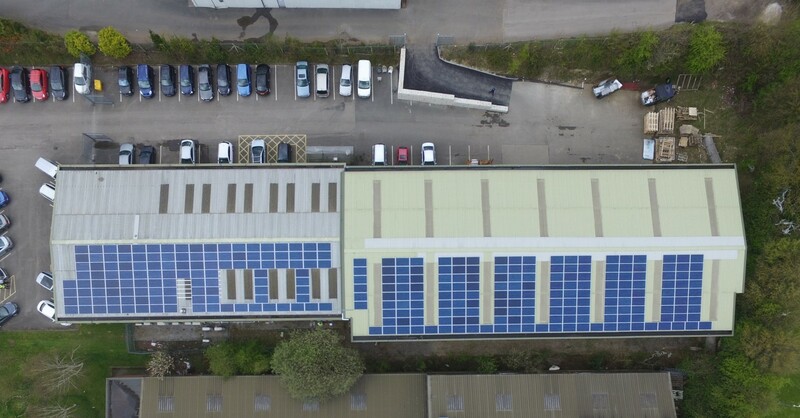 Custom Solar have helped customers from all over the country achieve savings and income so why not contact us and see what we can do for you? From a quick call to talk about your project to full system design and installation, our solar experts are ready for a chat. The solar PV system at AF switchgear has reduced the monthly expenditure on electricity but has also acted as a springboard for the launch of an all-electric car fleet.